The latest spot in Hennessey’s ‘Never Stop, Never Settle‘ campaign features a lavishly-produced short film entitled ‘The Man who Couldn’t Slow Down’ featuring British racing legend Malcolm Campbell. 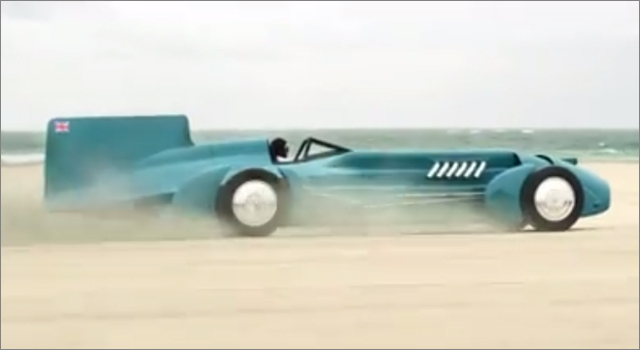 In the 1920s and 30s, Campbell set speed records on both land and sea in vehicles nicknamed Bluebird. One complaint — and I am by no means an auto-historian — is that the audio at the beginning of the ad refers to the Bluebird’s February, 1935 speed-record attempt of 276 mph, while the car shown in the ad appears to be the Campbell-Napier-Railton Blue Bird, recreating the events of February, 1931 when Campbell rocketed across Daytona Beach for a (then) record speed of 246 mph (396 km/h). The 1931 Bluebird (as shown in the ad) is on permanent display at the NASCAR exhibit hall at the Daytona International Speedway. The Bluebird in the film was built by Ghostlight Industries, a San Fernando, California-based provider of on-screen vehicles for the entertainment industry. Yes, it clearly appears that I am more interested in the car than the Cognac. ‘The Man Who Couldn’t Slow Down’ is the latest spot is ‘Never Settle, Never Stop’ campaign created by Droga5 NY. Other films in the campaign have featured Erykah Badu, boxer Manny Pacquiao and director Martin Scorsese. The Man Who Couldn’t Slow Down was directed by Martin de Thurah for Epoch Films.